The Michaud brothers, Frank and Albert, named their discovery “Jewel Cave” after the many calcite crystals that adorn the cave's walls. 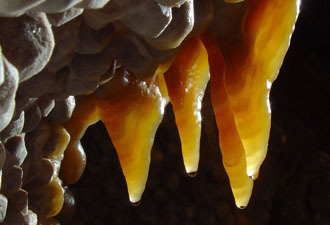 Visitors to Jewel Cave can marvel at these crystals on all of the monument's tours. Although Jewel Cave is mostly dry, the Scenic Tour displays a variety of red-hued dripstones, including stalactites, stalagmites, flowstone, and draperies. 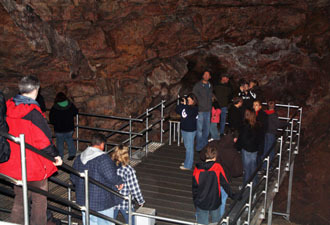 Visitors descend into the ever-popular Target Room of Jewel Cave, in preparation for their journey along the Scenic Tour route. A park ranger emerges into the Heavenly Room on Jewel Cave's Historic Lantern Tour. NPS.gov homepage photo of Jewel Cave by Dan Austin, NPS. A hidden gem in the Black Hills of South Dakota, Jewel Cave is a majestic landscape of crystal-covered rooms and flowing, translucent formations buried deep beneath limestone ridges and a ponderosa pine forest. Jewel Cave National Monument waits for travelers 13 miles west of Custer, S.D., and 24 miles east of Newcastle, Wyo. Discovered by two local prospectors in 1900, Jewel Cave was one of the first, and largely unsuccessful, attractions in the Black Hills. Eight years later, the cave caught the attention of President Theodore Roosevelt, who would eventually preserve the site as a national monument for the scientific interest of the public.. Visitors expected to find a small, rustic cavern. They entered carrying candles or lanterns and clambered down steep, ladder-like stairs constructed by the Civilian Conservation Corp in the mid-1930s. 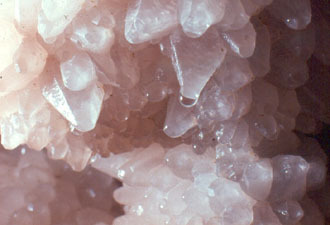 The descent left them surrounded by walls that, covered with calcite crystals, resembled a coral reef. 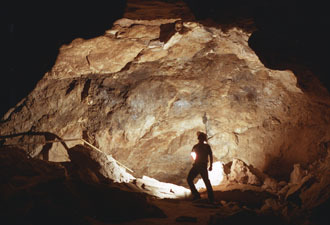 As the 20th century progressed, likewise did Jewel Cave’s exploration. Volunteers like Herb and Jan Conn, pushed the boundaries of the cave. By the 1960s it had been mapped far beyond the monument’s surface boundary. “Growing” a bit with each trip, the cave is 146 miles long – so far. That makes it the second-longest cave in the world. Continued interest in the monument sparked a desire to open even more passageways and in 1972 the National Park Service constructed a second entrance. This later entrance ultimately created the most popular cave route, the Scenic Tour. Visitors on the ranger-led tour traverse 723 stairs through a small section of the cave, which is electrically lit to highlight the various speleothems (cave formations). Along this path, adventurous visitors find crystal-coated rooms that vault 30 feet overhead and house an array of one-of-a-kind formations. For those who find the Scenic Tour too challenging, the Discovery Tour provides a guided opportunity to see one of the vast rooms within the cave. On the Discovery Tour, visitors witness nailhead and dogtooth spar – calcite crystals that line the cave walls and fill pockets throughout the passageways. This tour is barrier-free and fully accessible to all visitors. Visitation peaks in the summer months. Hundreds of daily visitors often fill tours hours in advance so reservations are strongly recommended. The Historic Lantern Tours are only offered during the summer because bats hibernate along this route in winter. If you travel to the monument during the winter season, please plan your trip well in advance. Severe weather, school field trips, scout groups, and limited tour times can make getting into the cave a challenge. However, with proper planning and communication, visitors will experience one of the most unique sites in the national park system. For more information, please contact the visitor center at (605) 673-8300 between 8:30 a.m. and 4:30 p.m. (MT) or visit the monument online at www.nps.gov/jeca.